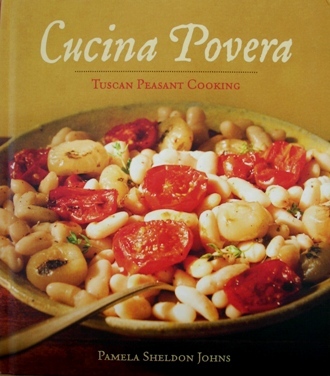 In Cucina Povera, Pamela Sheldon Johns has written a cookbook with authentic recipes based on Tuscan peasant cooking, but more than that she invites the reader to reflect upon the hard times of Tuscan peasants, and the meaning of making do with very little. She tells the stories of people she has met over the ten years that she has lived in Tuscany, particularly those who grew up in the aftermath of World War II. Don’t expect glitz here, just down-to earth stories laced with food memories that are heartbreakingly simple. A fig stuffed with a walnut and heated in a wood-fired oven still evokes fond memories of a nurturing mother from a man who is now a grandfather, while the photographs of elderly women cooking with gnarled hands give the reader a true sense of Tuscany’s past, long before it became a tourist hotspot. The recipes and stories connected with them change from the high, cold mountains of the Apuane where chestnuts were a mainstay, to the coastal plain of la Maremma and focus on the seasonal and wild foods available to poor Tuscans during extremely difficult times. From this poverty comes not only the ingenious use of a few basic ingredients to make a meal, but also making it flavorful enough to warrant a cookbook, which attests to the culinary skills of these home cooks. There is a small map on page 39 highlighting the places that Pamela Sheldon Johns writes about, which helps the reader understand the stories in the context of place and type of terrain. It made me think back to my own 17 years in Tuscany, and how so many of the dishes that John’s has collected had nourished my soul. The classic recipe for ribollita is shown first as a vegetable soup, the leftovers then reheated (“ribollita” literally means re-boiled) with bread, illustrating how nothing was wasted. Other classic recipes includes panzanella, a bread salad that is dressed with a few tomatoes and onions, to making crusty Tuscan bread the slow way, with a starter and long fermentation, to a simple springtime dish of eggs and peas. I tried my hand at making Cucina Povera’s version of ricotta cake. In following the recipe, I used the zest of just one lemon instead of two, which was the only thing I changed besides my black sweater, which I covered in powdered sugar while taking my first enthusiastic bite. The cake was as good and genuine as Pamela Sheldon Johns’ book. See the recipe below. 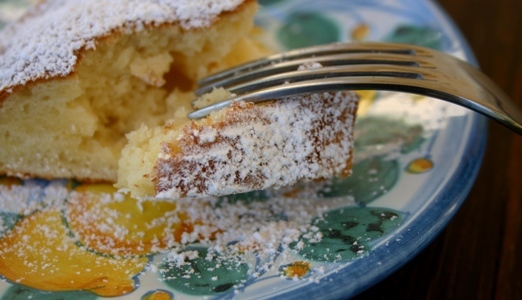 This ricotta cake recipe from Tuscany is by Pamela Sheldon Johns and can be found in her cookbook “Cucina Povera”. Yield: Makes one 9-inch (22 cm) cake that serves 8. In a large bowl, combine the egg yolks and sugar, and beat until light and creamy. Stir in the ricotta, milk, lemon zest, and salt. 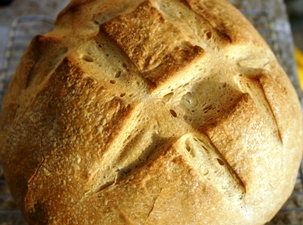 In a medium bowl, combine the flour and baking powder, and stir to blend. Add the flour mixture to the ricotta mixture stirring just enough to mix. In a large bowl, beat the egg whites until soft peaks form. Using a rubber spatula, stir one-third of the beaten whites into the batter, then carefully fold in the remaining whites until blended. Bake for 35 minutes, or until a toothpick inserted in the center comes out clean and the cake pulls away from the sides of the pan. Let cool completely, then loosen edges with a thin-bladed knife and release sides of springform pan. Dust with powdered sugar and cut into wedges to serve. Makes one 9-inch (22 cm) cake that serves 8. To see a map of Tuscany showing all the towns Ms. Johns visited and wrote about in her introduction, go to page 39 of Cucina Povera. I accidentally bought two of these on Amazon. Great book.